When we go to a supermarket and scan the fish aisle, we have a tendency to go straight for the choice filets – completely bypassing the most nutritious parts of the fish, which include the bones, tail and head–otherwise known as the “icky bits”. We’ve become a culture so disconnected with our food that we’ve forgotten what is good for us. 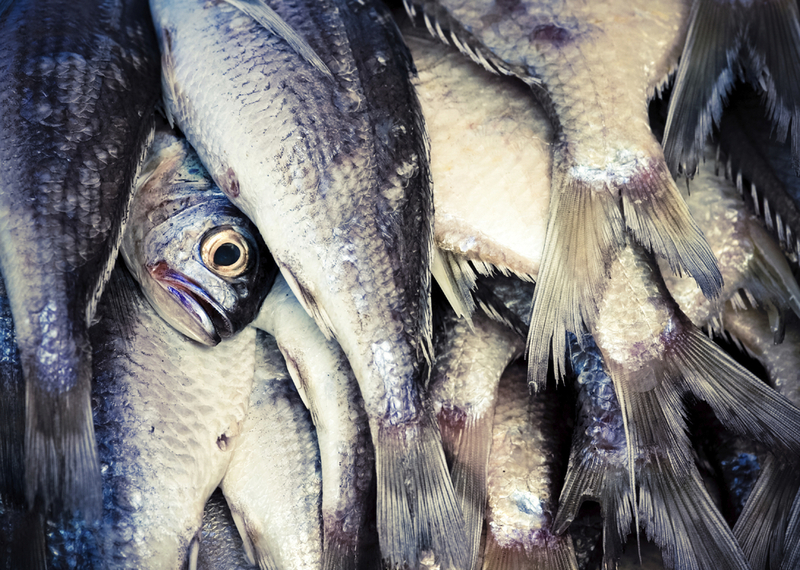 The bones of fish alone are around 10-15 percent of a fish’s weight and are often regarded as waste – but that’s the good stuff that we’re throwing away. 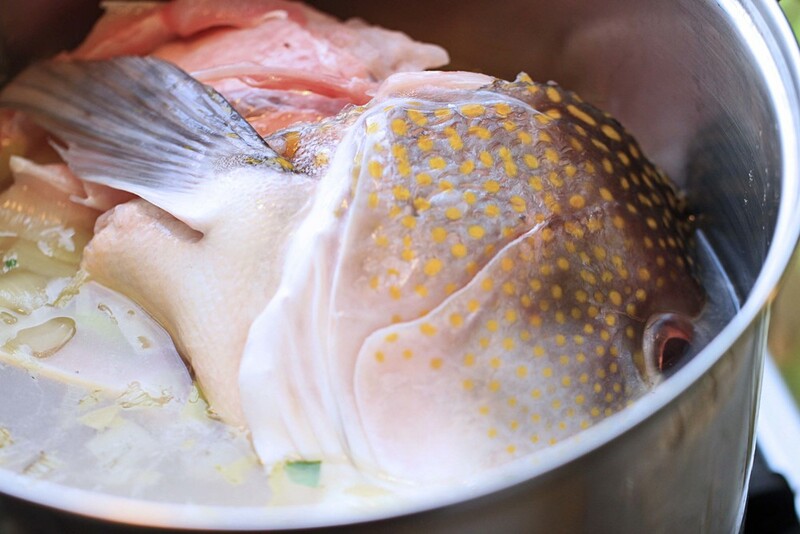 When we cook with a whole fish, it’s not only more flavorful – it’s far more nutritious. Bones are rich in vitamins and minerals, including calcium [ref]. NPR reports that fish bones, brains, cartilage and fat altogether contain high levels of vitamin A, omega-3 fatty acids, iron, zinc and calcium [ref]. When the broth cools, it often congeals due to the presence of gelatin, which contains essential amino acids and is highly prized for helping aid in digestion and promoting joint health. I remember my grandmother – and even my mother – making bone broth, but I had never really made it myself, so when the local fish monger said he was tossing out tilefish heads and asked if anyone at Good Eggs wanted them, I jumped at the opportunity to take some home with me. 2-4 pounds of heads, bones, fins and tails (or whatever icky bits you can get your paws on) of non-oily fish. You can use sole, bass, snapper…In this case, I used tilefish because it’s what was available. Make sure the fish is clean. Remove any blood, wash bones. Cut up the fish if need and place into a large bowl. 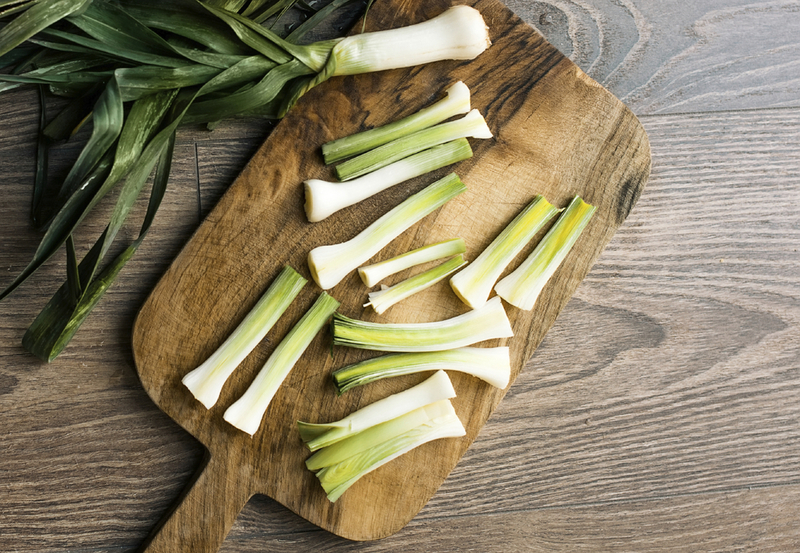 Quarter your leeks lengthwise and cut into slices. Wash them off in case they have any excess dirt. Drain. 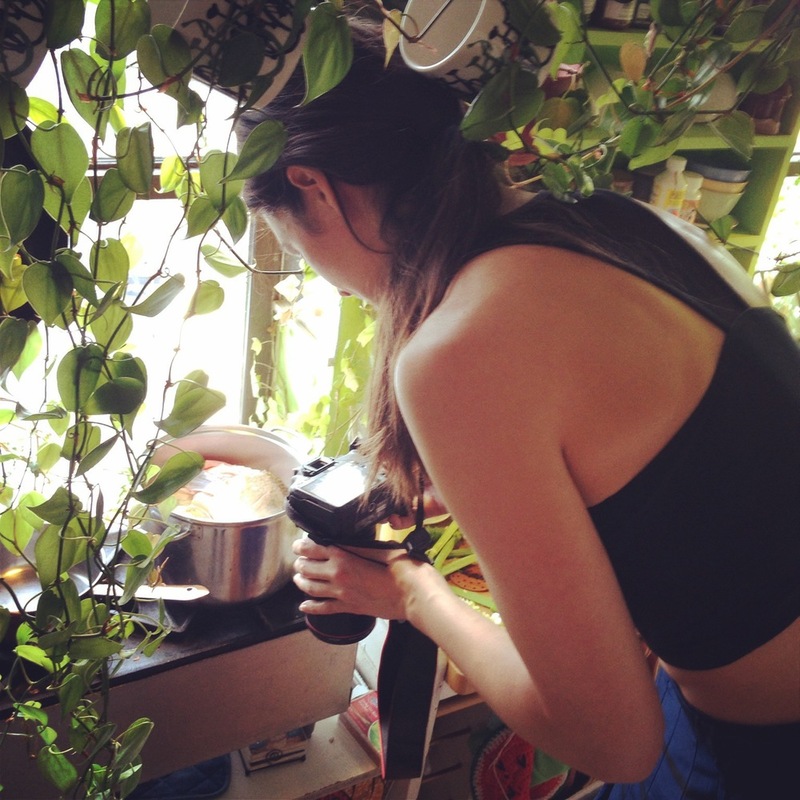 Make a bouquet garni. Basically this is just a piece of cheesecloth with a bunch of herbs in it. You can use whatever you want, but feel free to put the bay leaves, cloves, peppercorns and any herbs you have like thyme, parsley anything else you find tasty. Close the bundle and tie with a twine. Melt ghee in a large stockpot and add all the leek, onion, celery and fennel bulb. Cook it until tender and fragrant. That will likely take somewhere between 10-12 minutes. Once that is done you can add any small fish parts and stir for a few minutes, but if everything is large, like it was for me, then add everything all at once including the fish bits, the white wine vinegar, the bouquet garni, and enough water to cover the bones, head and tail. Bring everything to a boil. Skim any “skum” that comes to the surface, but fish is relatively clean so don’t be surprised if nothing “surfaces.” Simmer the water for 25 minutes – 1 hour, depending on size of fish. Prepare an ice bath to cool. Strain the stock through a fine sieve set over a large bowl. (This is where it is helpful to have a friend on hand!) Set the bowl in the ice bath. Cut up the leeks and quarter them. Make sure they are washed though. Leeks have a tendency to hold a lot of soil. Use the stock within one or two days or you can freeze it. I used it the following day to make a coconut milk fish soup, which ended up lasting me for a whole week! The tile fish I got barely fit into my stockpot, so I had to use a lot of extra water, which gave me a more “watery” version of fish stock. If this is the case with you, you can let it simmer down more. After this cooked, Jerry and I removed the fish and ate a lot of the meat that happened to be around the spinal column, head and cheeks. We had a full meal just on that alone! So much good stuff that would have otherwise went to waste!